Who really gets presents anymore? Today, when we are all so technologically-advanced, I am surprised there isn’t a well-known way for others to ascertain what you want. Besides having a wedding or baby registry, there really isn’t a great way. I love handkerchiefs so my friend TB was such a sweetheart and brought me a stack of them when she visited from London. I know Conrado is really into photography so I got him a gift certificate to a camera supply site. Since my birthday is coming up in eight days, I figured I’d enlighten all of you who I have inspired with my blogging! I’m going to put out into the universe some of the things I like. I actually think I’m easy to shop for. I like fur. I’d sure like a fur coat, but I also like fur stoles, pens with fluffy fur on the ends, purses with fur. I like fiction books. The ones that say New York Times Bestseller or Pulitzer Prize Nominee. I love cute journals, notebooks, calendars, stationery, note cards. I like chocolate–must be milk chocolate. I like scarves and handkerchiefs. I like all kinds of gloves. 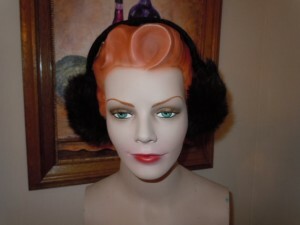 How cute are the $23 rabbit fur ear muffs I posted here. Click on the picture for the Etsy shop.